Where to get tires changed to snow tires? Since it is getting close to winter time, I want to go to a place to get my all season tires switched over to my snow tires. However, I have noticed that in this area and in general that it is very hard to find a good, reputable place that offers a reasonable price on tire changeovers. 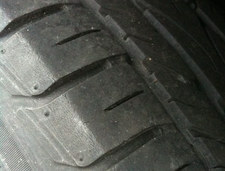 I recall that I could get these same tires switched over at a mechanic about 5 years ago for around 40 bucks easily. These days, I am often quoted at $90-100+ (especially at chain stores) for this same exact service completed on the same car. I would love to hear where your readers go to get their tires changed over at a reasonable price and if they can suggest any good (especially mom and pop) establishments that do a good job at changing over tires and don't charge a fortune for it. We're also curious to hear people's thoughts about snow tires in general -- we know some people swear by them, others seem less convinced. Got suggestion for TC, and/or thoughts on snow tires? Please share! Call Capital Tech Auto on Jefferson in Albany. They're great and super cheap. I've gone to them for a ton of tire issues. Also, something I use to do when I had a place to store them, you can get a second set of rims from a junk yard and have the snow tires put on once. Then you can just change the wheels twice a year. Capital Tech. They usually charge $20 but I have them already mounted on another set of wheels. GranPremiere in Rensselear was great for me. I have to second Casey's suggestion---a cheap set of steel wheels will make it simpler, cheaper, and you can do it yourself. And you buy them once. There's no comparison for snow tires vs all seasons. There's a good reason they're required in Canada. Hell, for $40 I would come to your house with a jack and change the tires for you. Grand Premier in East Greenbush has always done a good job with mine. Grand Premier is great. They are quick and they are good. Long story short. Right now you have 4 wheels + 4 all-season tires + 4 winter tires and you pay for installing your tires *twice* a year. Buy 4 more wheels, install your winter tires on them once, and don't pay for installing them for the rest of the average lifetime of your tires over each season. Grand Premier Tire in East Greenbush was great. They balanced my tires for me in no time and it was very inexpensive. A coworker got me thinking about snow tires probably 4 years ago now, and I wouldn't go back (since we're widening the discussion to the efficacy/benefits of snow tires) because the tread compounds are meant to deal with lower temperatures. Regardless of studded/non-studded if your tires are meant to play well in the snow/ice, so long as you drive reasonably, they will provide you benefit. Two years ago I had Mavis on Central (near Westgate) do it and it was $40. That's all I had done--declined alignment etc anything else they suggested. Go during the weekday and you can probably sit and wait. The people who are not convinced on snow tires are the ones I pass by in the ditch. I became convinced that snow tires could be a waste of money when I saw how much money my wife was paying to have them put on just to drive a constantly-plowed highway to work. Seriously, if you only drive busy main roads, I see no need for them. I have never had them over 135k miles of driving a Honda Civic, and have never felt in danger or gotten stuck. The big benefit to snow tires that you don't really get from 4WD/AWD isn't that they prevent you from getting stuck, its that they help you stop in slick conditions and give you more control. I'm more worried about getting in a pileup on the Northway then getting stuck. I'm not an expert on mounting tires, but I've heard people say that its more expensive now because they're using more advanced balancing machines with more expensive weights. I dunno what the benefit of this is, but smaller shops might be cheaper because they still use the old weights. Getting another set of rims used to be the way to go, but that's more complicated now because of the TPMS systems in many 2008+ cars. This is the light that tells you when you're tire pressure is low and relies on sensors in the rims. Running on rims without sensors gives you a light all the time and might cause issues with traction control (on my car traction control won't turn off). New sensors for the new rims might run you $100 and at least on my car every time you change rims you have to take it to a dealer to reset the TPMS with the different sensors for another fee twice a year. This is quite annoying for me, not sure if it applies to most/all cars with TPMS.